KINGSTON, NY--The scene was set up like something out of a zombie apocalypse movie. There was a large 150-year-old alms house that was in obvious disrepair, unmarked blue trailers with satellite dishes around the perimeter, and people in bright orange HAZMAT suits waving around handheld scanners and speaking in muffled voices. The Kingston Fire Department HAZMAT Team truck was parked near a blue sedan with what looked like a lifeless body in the driver's seat. Moments later several firemen were taken to the hospital exhibiting symptoms of what appeared to be toxic inhalation. The next call was to the New York National Guard's 2nd Weapons of Mass Destruction- Civil Support Team. That was the scenario given to the Scotia-based WMD-CST, CST for short, during their joint training event with the Kingston Fire Department HAZMAT team on Nov. 28, 2018. 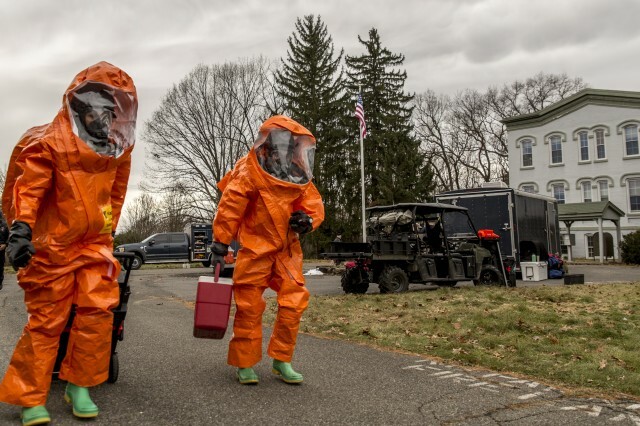 The CST has 22 full-time Soldiers and Airmen from the New York National Guard and supports local civil authorities during chemical, biological, radiological and nuclear (CBRN) events throughout the entire state of New York except for Long Island, NYC and Westchester County. "We're always looking for an opportunity to train with local fire departments," said Lt. Col. Aron Sacchetti, commander of the CST. Sacchetti, who has been in command of the CST for the past two years, is committed to enhancing the interoperability between military and local agencies during Chemical, Bilogical, Radiological., Nuclear or CBRN responses. His goal is to train in advance of an event and not meet for the first time when lives are on the line. Since the CST train with the newest equipment and procedures, the local agencies not only get to meet who they'll being working with, but also gain hands-on experience before they're called on during emergencies. According to Staff Sgt. David Hansen, the CST's training non-commissioned officer, a big selling point for local agencies engaging in the joint training events is learning the newest methods for decontamination. "These events become a 'train-the-trainer' opportunity for smaller agencies that might not have the resources available to send their people across the country every year to learn the newest techniques," Hansen said. The CST members were using Class A HAZMAT suits, providing the highest level of protection available, which included a 25-pound breathing apparatus that can safely supply four hours of clean air, two-way radios and heavy duty chemical resistant gloves. One of the new techniques practiced during the training was the use of a recently developed commercial decontamination agent for scrubbing the Class A suits after possible exposure to a contaminant. This replaced the previous method that included only water and bleach. Not only did this training showcase new decontamination techniques, but also marked the first time this CST had a civilian CBRN training company facilitate the exercise. Spc. Sean Murray, a survey team member or - 'one of the guys in the orange suits' - has only been with the CST for four months but can already appreciate the value of varied training scenarios. "The scenario called for recon on a car that led to an apartment of the bomb maker," Murray said. "We don't usually work with cars during military trainings and training outside of our comfort zone helps refine our skills; gets us ready for anything that comes at us." Staff Sgt. Kristin Northrup, a three-year veteran and survey team chief of the CST, agreed that the ability to adjust on the fly is important to the job, but building the team dynamic between agencies is a critical piece to mission success. 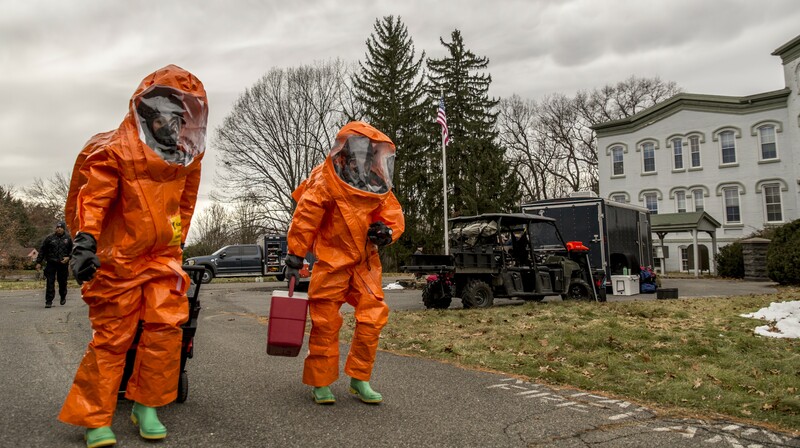 Northrup noted that the CBRN community is small and the relationships built during trainings, conferences, and exercises are key to saving lives down the road. "I attended an FBI conference on CBRN techniques and ended up responding an actual event a few months later and working with five of the people I met there," Northrup said. "The existing relationship was invaluable."